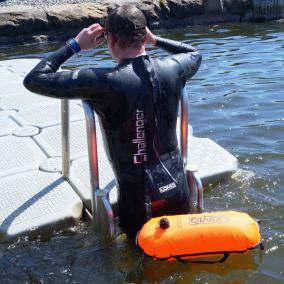 This article is a series of tips on being prepared for your first open water triathlon. Moving from the training pool environment to an open water training environment is a must, before your first open water event. It's important to remember that swimming in open water is very different from swimming in a pool. At the pool you can turn up, get changed, lock your gear away and jump in. The pool is a controlled environment, you know it’s safe, clean, warm and their always a lifeguard on hand (usually). Open water swimming is not in a controlled environment, so there a lot more things to consider, before getting in the water. The last time you swam in the sea on holiday, how did you feel? Were you by yourself? Were there lifeguards on the beach? What depth of water were you swimming in? Was the sea water crystal clear? Everybody is different and some may be more fearful than others, but it worth planning your first open water training swim. To feel at your most confident on the start line, it is important to have experienced open water swimming, before your event.. If possible join an organised open water swim group or a club training session, but ensure the organisers are aware that this is your first open water swim. You still need to consider some of the following tips even in an organised session. Is it a windy day causing bigger waves or ripples? From which direction? Visibility – how far can you see? If you can’t see far then others will not be able to see you. Are you wearing a bright-colored swim cap? Black caps do not stand out well, orange, bright green, caps are good, white caps can be lost in the crest of a wave. Check the condition of the sea/lake and the water temperature beforehand and decide whether it is a good idea to get in the water. Is your wetsuit in good condition and fits you. Take note of any fishermen on the banks or sea edge and where they are fishing. Are there any boats, jet-skis, windsurfers about in the area you are planning to swim in. Before getting in the water, find a reference point that will help you situate yourself in the water in terms of your starting point. Do the same thing once you're in the water. Using lifeguard huts as reference points could cause a problem since there are several along a stretch of beach, unless you know its number. This is an accessory, and is usually a bright colour. It has no influence on your swimming and its purpose is to make you visible in the water. It can also help as an aid to float while getting your breath back. Some safety buoys double up as a dry bag and safety buoy, which allows you to keep personal items with you without leaving on the bank or water’s edge. In open water you will be lifting your head up to breathe while looking straight ahead to see your reference points. Depending on how straight you swim (last month’s article) you may need to sight every 5 or 7 strokes. Breathing in the sea or lake can be an issue, depending on how windy it is on the day. The waves tend to be a bit bigger. Turn your face away from the waves, breathe on opposite side. Ideally, it’s good to know the venue where you do your first open water swim, but realistically unless it is local to you, then you have to consider other options to gain knowledge of the new venue. One option is to visit the venue before race day. Alternatively arrive early on the day, to check it out. If arriving early is it viable to get a practise swim in. Look at where the buoys have been positioned, the entry and, exit points any distinguishing features to “sight” on when on the return to the exit point. Is the swim one lap or two. If two laps, where is the exit point for first lap and entry point for second lap.